Posted on April 28, 2015 at 4:35 am. Editor’s Note: During Dance Exchange’s time here in March, they facilitated a Tools for Health Training workshop over a weekend. Here is a post by a familiar face of the GeriActors and Friends Rhiannon Perley-Waugh. When I received the email newsletter from the GeriActors about the Tools for Health Training workshop I was incredibly excited. Since graduation, I have been interested in pursuing a masters in Drama Therapy at Concordia University in Montreal. As such, when I saw that the workshop would be providing information on how the arts can be used as therapy, I knew it was something I needed to take. Before the workshop I knew very little about Dance Exchange – as a company – and thus went into the workshop naive as regards the kind of work they do. I was certainly expecting to expand my knowledge of the “art therapy” field, but beyond that wasn’t quite sure what to expect. Would we be sitting, reading power-points all weekend? Would we be watching health education videos? Who knew! Well. Little did I know I was in for an absolute intellectual and personal growth adventure! There were no powerpoints. No videos. Just pure movement and interpersonal engagement. The workshop with Dance Exchange was interactive and engaging from 9:30 in the morning March 14 to the drive home from St. Albert on Sunday March 15. The company took the workshop participants through many exercises such as mirroring – where you are in pairs and one person leads movement and the other must mirror that leader. Perhaps one my favourite moments on the Saturday portion of the workshop was carrying out the ‘build a phrase’ exercise. We started with a simple prompt – “These hands have held”, wrote a response to that prompt, then shared with the group what we had written. It was through this sharing the building began. We learned that there were 4 ways to pick out/develop movement from spoken words/text: images, spontaneous gestures, action words and clear details. Thus, we created movement gestures out of moments where these 4 things were presented in our sharing of “These hands have held”. Then as smaller groups, we continued the exercise and created a dance piece. The next step of this exercise was to apply nuance to the initial creations – building on moments of connection, thinking about spatial formation, levels, tempo or individual vs. group moments. The end performances be each group were truly magical. They were moving stories, being told from the heart of each individual and then, simultaneously, the group. That afternoon, we broke down the format of the workshop as it had happened in the morning – which I found extremely helpful in grounding all the work we had done and seeing how it could be carried forward in a therapeutic/clinical context. My perhaps favourite part of this workshop was our Sunday visit to the River Ridge senior home in St. Albert. It was our chance to apply what we’d learned in real-time and apply to a context of older adults who had varying physical and mental from ourselves. From the moment we arrived there was excitement in the air on both accounts, the seniors and us workshop-folk alike. Seeing how the workshop engaged with seniors and brought smiles to their faces was the most heartwarming experience I had had in quite a long time. I worked one on one with some seniors and at the end was the leader of a small group- building a dance, just as we had in the previous day’s workshop. We laughed, we played, we spoke, we moved – we created a dance. By the end of our experience there, my heart was bursting with delight and I was touched beyond words at the “healing” that had happened, not just with the seniors, but to myself. Needless to say, this experience inspired me incredibly. I have therefore decided to begin applying for positions as recreational or life enrichment staff in senior’s homes around the city. I would love to bring my knowledge from this workshop (both the exercises themselves, and also how to build an effective workshop) as well as my background in theatre into more lives and start to gain more experience working in geriatric contexts and/or homes. Furthermore, my experience in this workshop has increased my desire to fulfill the long-term goal I had at the onset of pursuing Drama Therapy in Montreal. I have nothing but thanks for Dance Exchange, and the GeriActors for providing me with this experience! Posted on April 9, 2015 at 4:10 pm. We are busy with preparations for the Creative Age Festival happening June 4-6 at the North Edmonton Seniors Association and Timms Centre for the Arts. The Creative Age Festival features performances by seniors and intergenerational artists as well as workshops in a variety of art forms. This year’s festival will have 8 workshops to choose from in music, theatre, creative writing, dance and much more. Grindstone Theatre was formed in 2011 by Artistic Director, Byron Martin, to create new late night content at the Varscona Theatre. Grindstone’s flagship show, The 11 O’clock Number! is currently in it’s third season and it continues to attract attention for its unique form of musical comedy entertainment. Aside from it’s weekly show, The 11 O’clock Number! has performed for The Liberal Party of Canada, Fountain Tire/United Way, Edmonton Potterwatch, HSBC, Edmonton Children’s Dance Theatre and many other corporate events. The show has also toured festivals across western Canada and to New York City. Shirley A. Serviss is a long-time participant in Edmonton’s literary scene as a writer and writing instructor. She has published three collections of poetry and co-edited two anthologies. Her poetry and personal essays have appeared in numerous literary magazines and collections. In addition to teaching at MacEwan University and the University of Alberta’s Faculty of Extension, she has taught at numerous seniors’ centers and for the Edmonton Lifelong Learning Association (ELLA). Shirley also works part-time as the staff literary Artist on the Wards for the Friends of University Hospitals. The GeriActors & Friends are based at SAGE (Seniors Association of Greater Edmonton) and supported by the Drama Department and Faculty of Arts at the University of Alberta. They perform to the general public, seniors and caregivers. The ‘Friends’ are students and alumni from the University of Alberta. 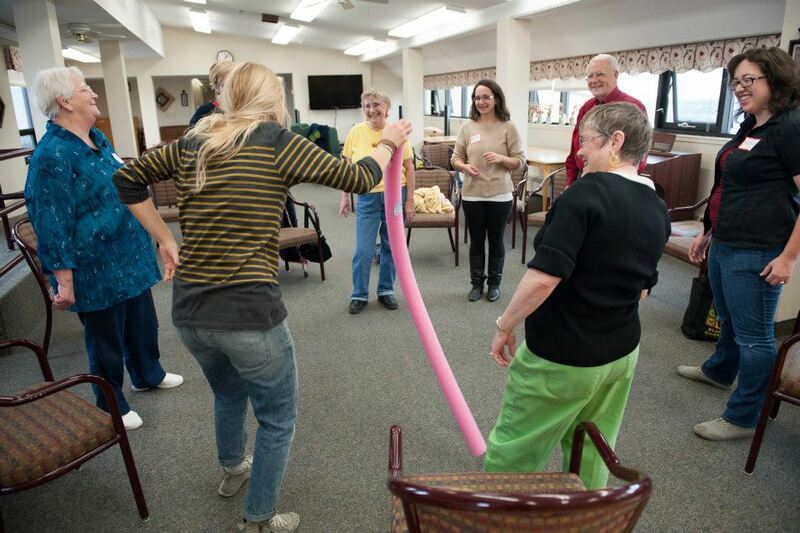 The GeriActors Outreach Program includes workshops for seniors in Comedy Improvisation, Performance Storytelling, Acting, and Creative Movement. They also help to produce the Creative Age Festival and Under One Sky, a theatre project with multicultural immigrant seniors. They believe in the principle of ‘creative aging’, in which seniors become engaged in artistic activity at a level of comparative mastery. This leads to effective artistic expression, a developing sense of community, social and civic engagement, and an overall increase in health and well-being. Registration opens May 1 – keep your eyes peeled for more information about the Creative Age Festival 2015. GeriActor’s and CRIPSiE are dancing again! Posted on April 8, 2015 at 8:26 pm. 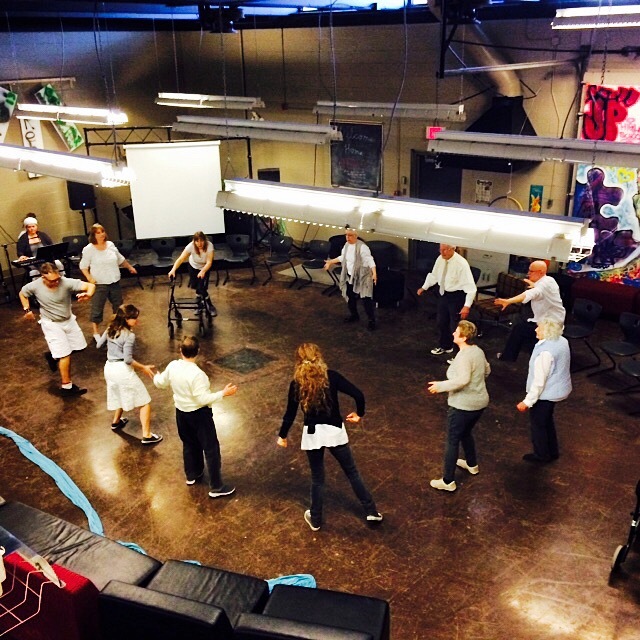 Editor’s note: The GeriActors and Friends were excited to have Amanda Newman, Shula Strassfeld and Kevin Ormsby from Dance Exchange last week to facilitate a two week dance/movement workshop series in conjunction with a local mixed-ability group called CRIPSiE. Here is a blog post by Bill Yong about the first day. Stay tuned for additional blog posts about the experience. Its always a treat when Dance Exchange visits the GeriActors, we are reminded the potential our bodies have to create, share and understand. Here are a couple things to remember when taking a Dance Exchange Workshop. 1. Always say things twice: Sometimes the brain needs a second run through to gather all the information/instructions needed. It could also be helpful to present the information in a different way (physically or use a simile!). Understanding and common ground are necessary when working with a big group. 2. The Private Studio: Everyone’s got a private studio. Its portable and the handiest thing ever. The private studio is a private space you go into discover, figure things out or rehearse for one last time before presenting something. Access to this studio is as easy as turning your body away from the group for a moment. 3. Forgetting is a very natural editing tool: If you didn’t remember it, was it really all that necessary? 4. There’s no such thing as a wrong answer: In the world of dance, everything you do is an offer. The smallest offer can elicit the biggest opportunities. GeriActors and CRIPSiE warming up with Dance Exchange.